Throughout his career, John Van Barriger has worn a lot of occupational hats. In addition to founding an outdoor apparel and gear company last year (The Outdoor Kind, LLC), his video documentary work has been displayed in the Smithsonian Institution’s National Museum of American History in Washington, D.C. While he produced a number of short-subject documentaries, he also produced, directed and wrote a full-length documentary on early American motorcycling. Additionally, John is an award-winning writer and photographer. He has had hundreds of articles and photos published in periodicals in Australia, England, Japan, and the U.S.
A lifelong outdoorsman, the former associate editor of American Motorcyclist magazine is passionate about adventure travel. Having grown up in a small Midwestern town, John feels outrageously lucky to have backpacked, camped, paddled, bicycled, motorcycled, snow-shoed, or gone cross-country skiing or scuba diving on five continents. 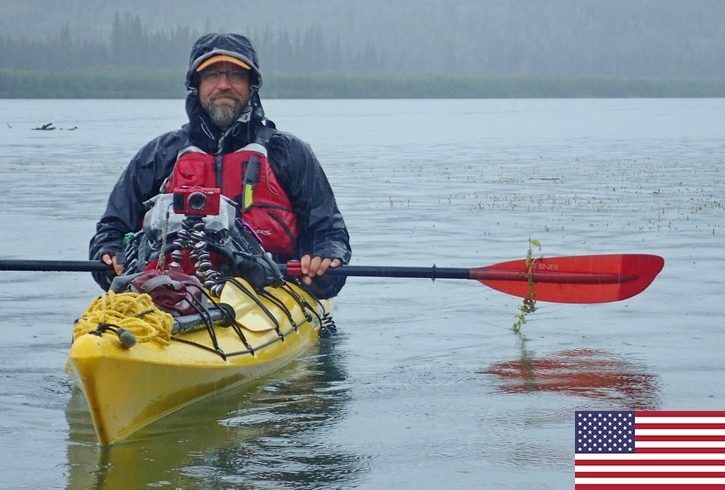 He frequently speaks at leading paddle shows, such as Rutabaga’s Canoecopia, the Quiet Water Symposium, and Midwest Mountaineering’s Outdoor Adventure Expos. In the more formal business arena, John also provided corporate communications and media relations work to numerous organizations, ranging from a nonprofit medical facility and an educational association to Fortune 500 companies such as The Charles Schwab Corporation and Pacific Gas & Electric. Editor’s Note: John is one of six team members that will take part in the expedition, and one of several American paddlers on the journey. Read the other team members’ bios to learn more about this unique group. Website and All Content ©2018 John E. Van Barriger. All rights reserved. Reproduction in Whole or In Part Prohibited.